One of the most important factors Google considers with search results is your current location. And they’ve gotten pretty good at knowing where you are, too. Search engines study your computer’s IP address or GPS location to pinpoint your location. They understand that where you’re standing plays a big role in what information you’ll find relevant when performing a search—especially when looking for local establishments, like a restaurant or laundromat. Not long ago local consumers would type the name of their city alongside the search term (e.g. car insurance Atlanta) to get local suggestions. But anymore, Google is smart enough to know where you are without asking. More often than not, Google places local businesses at the top of search results. They know, for instance, that people who search for ‘Chinese food’ are likely more interested in finding a place nearby for some beef Chow mein than info on a popular New York restaurant 900 miles away. The same goes for most establishments that can be found locally (e.g. home insurance, tree stump removal, plumber). There are several ways someone will discover your business via a search engine. They could be directed to your website, your social media profiles, or your official business listing. And, although they’re all somewhat interconnected, organic SEO focuses primarily on the first two – whereas local SEO focuses on the latter. A common misconception with SEO is that it revolves entirely around directing people to your website. The truth is, people are introduced to businesses everyday without visiting their website at all. These businesses are discovered via Google’s official listings, serving as a directory, like an online phonebook. As a matter of fact, some businesses rank high on local search without having a website at all. And if their local search signals are strong they’ll likely end up above businesses focusing on organic SEO alone. Of course, having an established website does help your online visibility, even locally, but focusing on your website alone is not an effective approach. Local SEO aims to increase the likelihood that a nearby business listing (in contrast to website) will rank higher for people searching for products or services within a limited proximity. Organic SEO aims to increase the likelihood that a company website will be discovered by people searching for relevant terms online, through non-paid means, and within a much broader proximity. 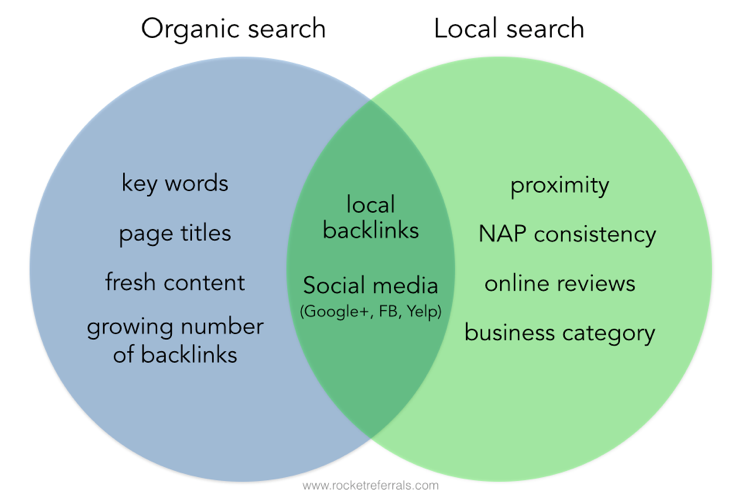 It’s true that organic SEO and local SEO strategies often intersect. But there are elements that local businesses should prioritize ahead of those companies operating nationally—specifically in regard to local search signals. Location, location, location. Google places significant weight on the distance a search query is from local establishments when determining search rankings. Yet, short of relocating your business—or operating a food truck—your proximity to prospects is static. But just because a competitor is marginally closer, it doesn’t mean they will rank higher. This is because Google’s algorithms take fixed distances into consideration, so as long as you’re within a predetermined range you’ll be okay. For example, within a densely populated city Google may place more weight on businesses within a square mile of a search. In rural communities, however, this range could be expanded to several miles. Proximity is just one of several factors that impact local search, but it’s a big one. Being in range will get you in the game, but it doesn’t guarantee you’ll end up high on search results. NAP consistency means that a business’s Name, Address, and Phone number are uniform across the internet—with both online directories and websites—wherever your information is listed. Search engines regularly collect information from all the nooks and crannies of cyberspace. This data is then stored for easy access when people perform searches online—this process is called web crawling. One of the things they are looking for is consistent information regarding businesses. The more often an establishment is accurately listed across the net, the more confidence the search engine has in it. And higher confidence means more recommendations for relevant search queries. Even slight contrasts in a business name, address, or phone number will likely create duplicate listings online and throw off search engines. For local SEO it’s important to always use your local address and phone number. If, for example, you have a toll-free number you should list your local number first. NAP consistency is perhaps the easiest way to substantially increase your local SEO. Utilizing data aggregators is the quickest and most effective way to ensure accurate listing across the web—which you can find information on within this course. The image above is a great example of how computers can fail to recognize duplicate records because of slight variations in NAP. These two brochures were received on the same day. Reviews across third-party websites are important on a couple fronts. First is the obvious social-proof element which helps people choose between competing businesses. Then there’s the positive impact online reviews have on local SEO. Positive online reviews increase the prominence of a business in the eyes of search engines—an important factor when determining search rankings. Google, for example, has tied their local review feature directly into the business listings themselves. Whereas sites like Bing and Yahoo rely on Yelp reviews for their search rankings. In regard to local SEO, search engines look at the quantity and frequency of online reviews. A single wave of reviews from a couple years back doesn’t do much good in regard to SEO. But a review every week or two will make a big difference. Similar to the old phonebooks, online directories operate within the framework of business categories. So it’s important to get this right when setting up your business listing across the net. It should be pretty straight forward, but similar categories may present themselves which could be confusing. Always choose the more local option. In other words, consider what a potential client would be searching for and pick that—e.g. insurance agency over insurance company. A backlink is the term for a hyperlink to your website from another website. If someone mentions your business or website, they will often include a link so that their visitors can easily locate you online. Having quality backlinks to your website builds prominence in the eyes of search engines. They figure there must be a good reason other sites are linking to you. So, the greater number of backlinks, the higher your organic search rankings. Having backlinks benefits both organic and local SEO. However, if you’re looking to boost your local ranking, then your backlinks should come from websites that are located within your community. This is because local backlinks signal higher relevance within a specific community. The interconnectedness of the internet encourages businesses to become active across several mediums. Social media is growing in significance as it begins to infiltrate search results outside its direct social network. In other words, what you do on social media can impact your chances of being discovered on search engines. Facebook, for example, has recently implemented the ability for users to review local businesses which have more staying power than your ‘Shares’ or ‘Likes’. Facebook’s business listings are also linked directly to common data aggregators and major search engines—reinforcing that they’re relevance is increasing with local search. Google+ is now linked directly to the Google My Business platform. A business’s NAP, reviews, category, and social media shares are all located atop the same Google chassis. Therefore, becoming active on the Google+ front directly impacts your local SEO. Although Google does not disclose their algorithm, research has shown a direct link between sharing content on Google+ and local search rankings. This post is quite an impressive post and gives best ways how to discover any business online. This post describes all the benefits of local search and organic search in terms of business promotion.